Saxon Switzerland is a real Mecca for cyclists and hikers. An elaborate network of paths and trails lead to breathtaking look-out points and through deep gorges. The Saxon Switzerland National Park is Germany’s only mountainous national park. The picturesque and rugged Cretaceous landscape and its fascinating micro-climate play home to a plethora of rare plants and animals. A stop-off in Dresden is one of the best parts of cycling the Elberadweg. Pirna is a wonderfully renovated city with plenty of renaissance buildings. Definitely worth a visit. 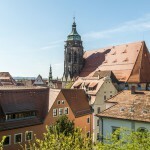 Stadt Wehlen is a small town with a charming marketplace with a cyclist church and plenty of cosy cafés and ice cream stands. The oldest spa town in Saxon Switzerland, Bad Schandau is the perfect base for tourists and travellers to enjoy excursions or hiking. 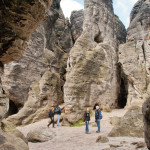 Kurort Rathen: At the foot of the world-famous bastion in the middle of the Saxon Switzerland National Park, you’ll find a place that’s sure to enchant and provide a welcome change. 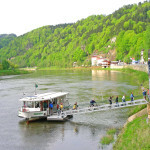 Thanks to its location up in the Elbe valley, Heidenau is a perfect, central base for visitors. The symbol of Königstein, the fortress, is nestled in the bizarre rocky landscape of Saxon Switzerland. Schmilka is a small town located on the Czech border.